Verdier Laguiole is another French cutlery company that dates from the 19th century. An industrial manufacturer, it has developed a unique system for putting a serrated edge on both sides of a 1.8mm thick Laguiole steak knives, keeping them sharp forever. The company offers a range of ABS handle Laguiole steak knives, carving sets, salad service, and tableware at prices far below what is normally seen with this type of cutlery. Offered in both beechwood gift boxes or cardboard packaging, this quality cutlery can be personalized on the blade at request. 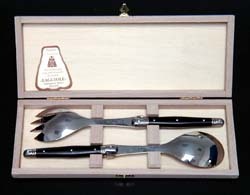 Salad Set Black, two piece salad service with black ABS handles, in wood gift box. 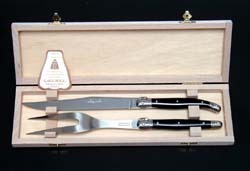 Carving Set Black, two piece carving set with black ABS handles, in wood gift box. 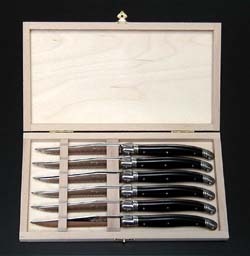 knives with black ABS handles in a wood gift box.